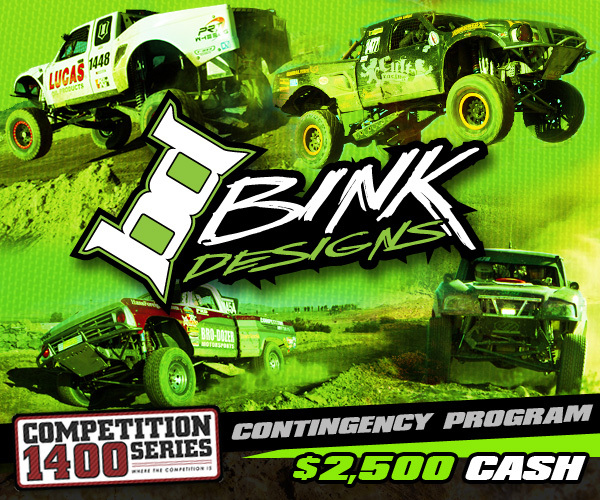 Bink Designs is proud to support the Competition 1400 Series and will be offering contingency support to racers that compete with a chance to win $2,500 in Bink Designs “HARD CASH” and possibly additional surprises throughout the season. 1. In order to qualify for contingency awards, the race truck must display Bink Designs 14″ decals prominently on each side of the truck during the race. Decals will be provided by Competition 1400 during tech/contingency. 2. Photos and Video: We strongly encourage teams to hashtag #binkdesigns or comment @binkdesigns and submit photos or video (with written consent from photographer/videographer) of their truck after the race for additional exposure on binkdesigns.com, social media outlets and additional promotional materials. 3. Award recipients will receive a Bink Designs “HARD CASH” certificate valid for one year from date of issue redeemable only at Bink Designs for actual cash money. 4. 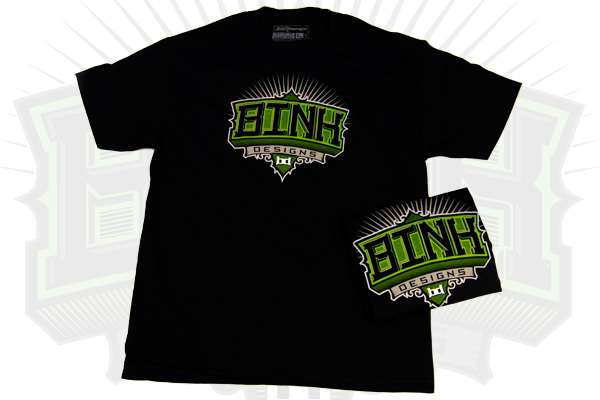 Each registered truck will also receive one Bink Designs T-Shirt. Shirts for any additional team co-drivers or crew will be given at a cost of $10 each. Please give us a call if you have any questions regarding the Bink Designs / Competition 1400 Series Contingency Program. Good luck this year to all 1400 race competitors. Only vehicles entered in Competition 1400 Series are eligible for contingency awards and eligibility is limited to one contingency award per vehicle per event. Bink Designs is a premier graphic design company located in San Diego, CA. Since 2003, Bink Designs has been committed to providing cost-effective solutions for clients’ high-end graphic needs. Bink Designs will work with you to develop a strategy that matches your goals. Bink Designs offers a number of services, including: Identity, Print Design, Vinyl Graphics, Web Design, Photography & Apparel.